The only biographical dictionary on African-American business leaders, this volume provides biographies on 123 individuals. Covering significant Black business leaders from the early days in America to the present, it includes many individuals who do not appear in general African-American biographical collections, and provides extensive information that is not available in other sources. Each biographical profile provides comprehensive coverage of the individual, and includes comprehensive bibliographical information. The volume also includes appendices classifying the business leaders by place of birth, principal place of business, type of business, and women business leaders. An extensive general bibliographical essay provides information on works giving background information, and the volume concludes with a full subject index. 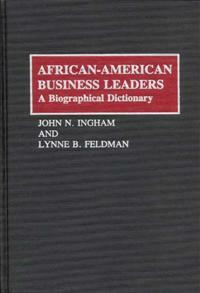 This entry was posted in Books and tagged african american business, john ingham, lynne feldman. Bookmark the permalink.